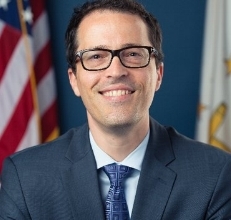 Eric Beane, RI Secretary Of Health And Human Services, To Step Down; Career Options "Open"
Eric Beane, Rhode Island’s Executive Secretary of Health and Human Services, will step down at the end of the year, the office of Governor Gina Raimondo announced Nov. 15. Over the four years of Raimondo’s first term, Beane has served the governor in several high-level capacities, most notably as a troubleshooter assigned to clean up the disastrous roll-out two years ago of UHIP – Unified Health Infrastructure Project – a computerized public assistance system that left thousands of needy individuals without benefits. Raimondo has appointed Lisa Vura-Weis, a deputy chief of staff in her office, as interim Secretary while a search for a permanent replacement is underway. Beane, whose last day on the job will be in mid-December, plans to travel and spend time with family and friends, according to a spokeswoman for the Executive Office of Health and Human Services. He is “leaving his career options open,” the spokeswoman said. In a statement, Raimondo said she is “deeply grateful for Eric's four years of service to the people of Rhode Island. Because of Eric's work, Rhode Island's health and human services are undoubtedly stronger today than they were when I first took office." Beane, a former trial attorney for the U.S. Department of Justice and former deputy chief of staff for former Governor Martin O’Malley of Maryland, came to Rhode Island as Raimondo’s deputy chief of staff in 2015. He also served as Raimondo’s Chief Operating Officer, overseeing social services, and served as acting director of the Department of Human Services before he was named to the Secretary’s position in the wake of UHIP scandal in May, 2017. As acting Secretary, Vura-Weis will focus primarily on budget and management and help with a comprehensive search for a permanent replacement to Beane, according to a statement issued by the governor’s office. In her current position she has focused on health and human services, administration, and management, working closely with Beane and Raimondo on UHIP. Before joining the Raimondo administration she worked for the Boston Consulting Group on projects related to healthcare effectiveness. Vura-Weis also has worked for the state of New York on healthcare insurance reform. She has a master’s degree in business administration from Columbia University and a master’s degree in public health from Princeton. The Secretary of Health and Human Services oversees the Departments of Health, DCYF, the Department of Human Services, and the Department of Behavioral Healthcare, Developmental Disabilities and Hospitals (BHDDH). Among other things, BHDDH is charged with implementing reforms in services for adults with developmental disabilities to comply with a 2014 federal civil rights agreement with the Department of Justice.